Ready to finally play some Pokémon on your HoloLens? Here is your chance! 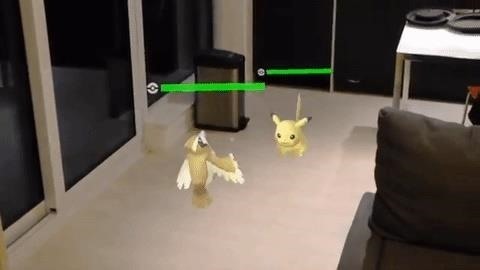 KennyWdev has released a video showing off his newest build of PokéLens, a Pokémon clone for the HoloLens similar to Pokémon GO. In the video, you get to see two Pokémon battle it out on what appears to be an office floor. Apparently, Pikachu is "super effective." This coincidentally appeared online the same day that another developer, Sky Zhou, showed off his Smash Brothers-style Pokémon game. It appears that only Pidgey and Pikachu are available to battle right now, but in other videos KennyWdev's YouTube channel, it appears that you can use either character. In this most recent video, he also explains how to get the code (available on GitHub) for the game and what resources to use in order to figure out how to get it up and running on your own HoloLens. Of course, we have many tutorials that can help with that here. Let us know if you having any issues getting this software to run, and we'll see what we can do to help.